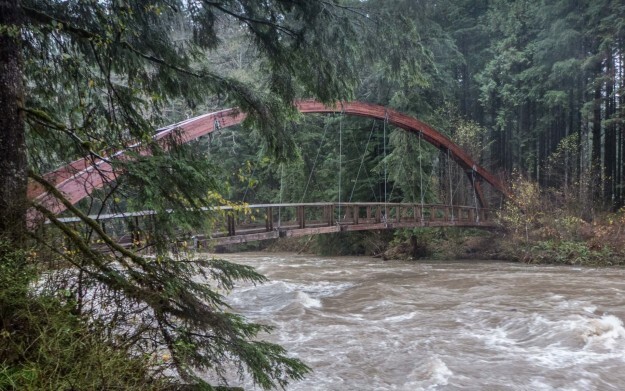 A heavy rain storm on Halloween weekend that dropped 4 1/4 inches of rain over 2 days resulted in a peak flow of 22,400 cfps on the Middle Fork river. 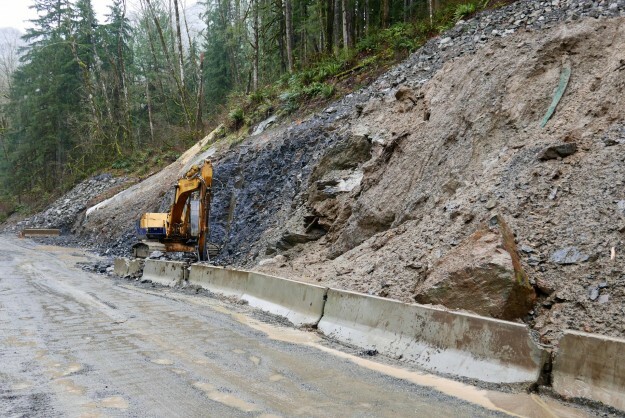 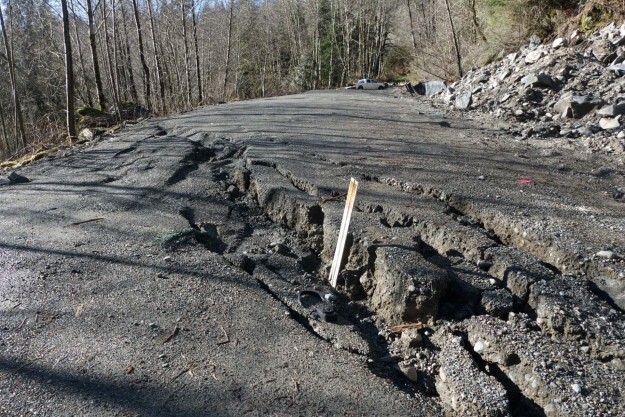 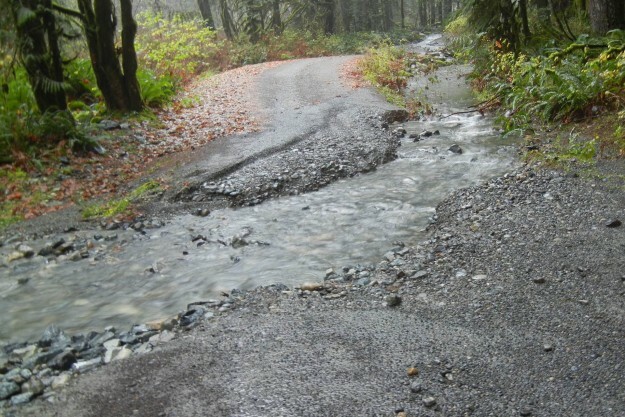 The rain was steady without a heavy downpour at any one time and there was no snow to melt in the mountains, factors which helped avoid major damage to the road. 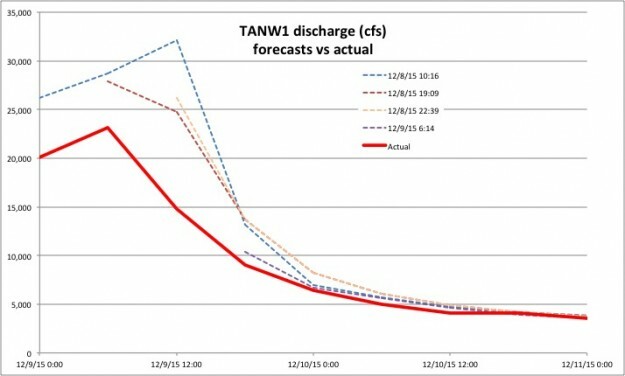 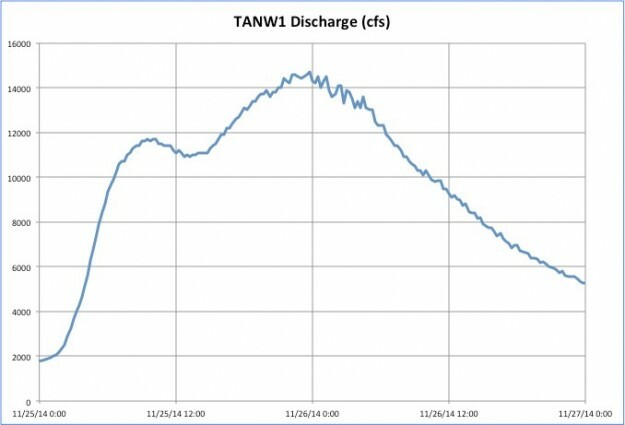 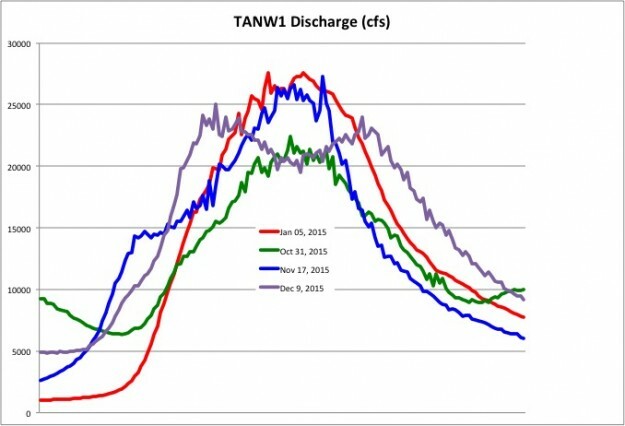 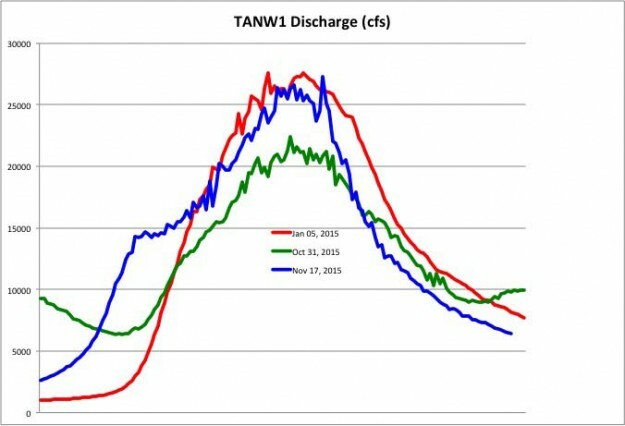 But flows of ~20,000 cfps were sustained for 5 hours. 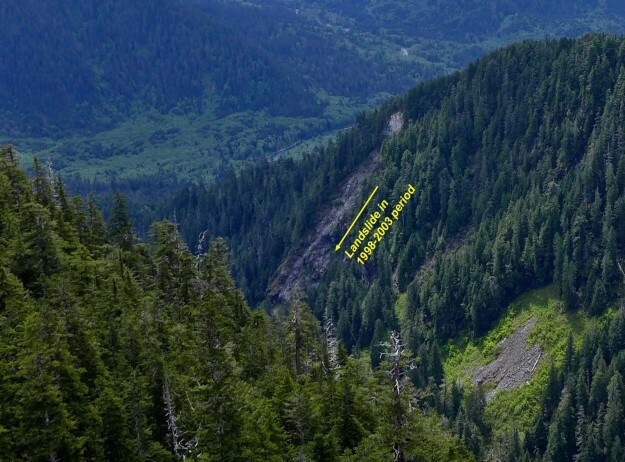 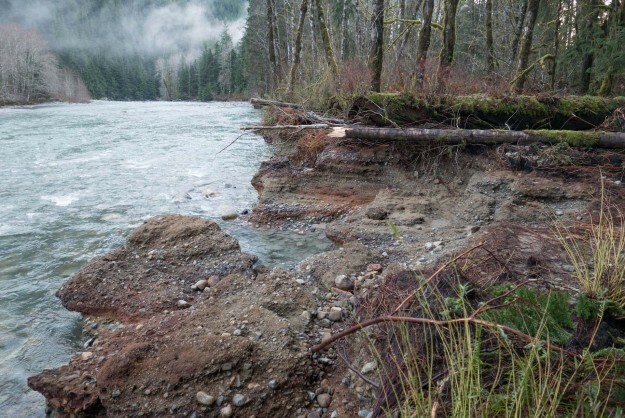 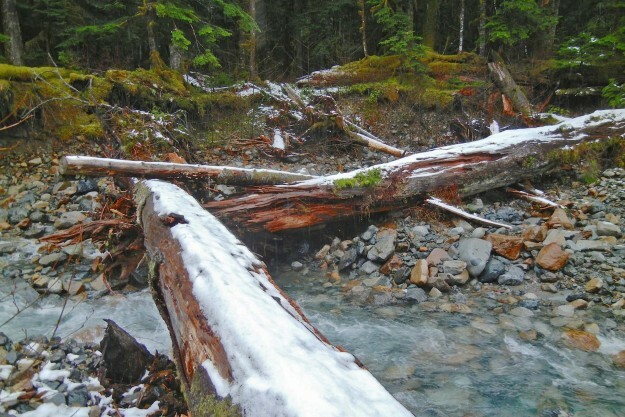 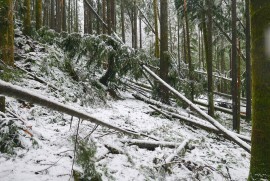 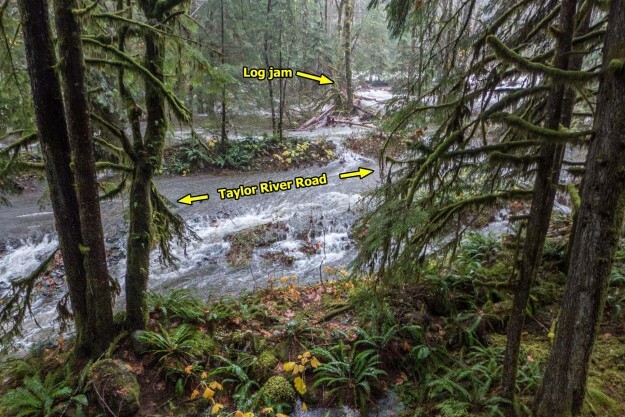 The Taylor river was especially wild — a log jam formed just above the turn off to Dingford Creek and caused part of the river to flow over the spur to the Taylor River trailhead. 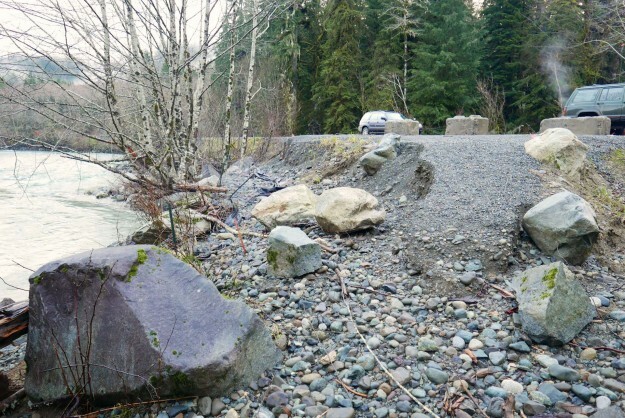 Later reports indicate that SUV style vehicles should still be able to negotiate the trench eroded across the road (see the last photo below). 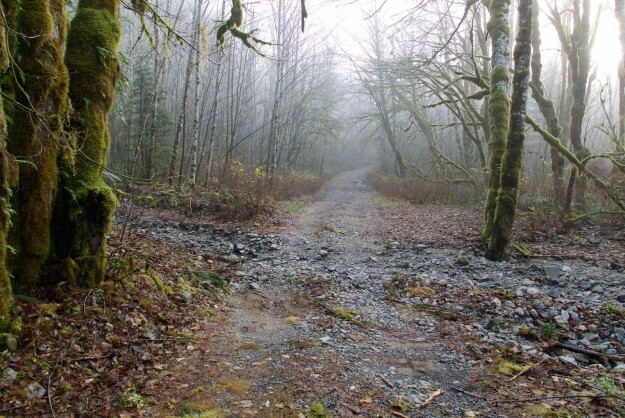 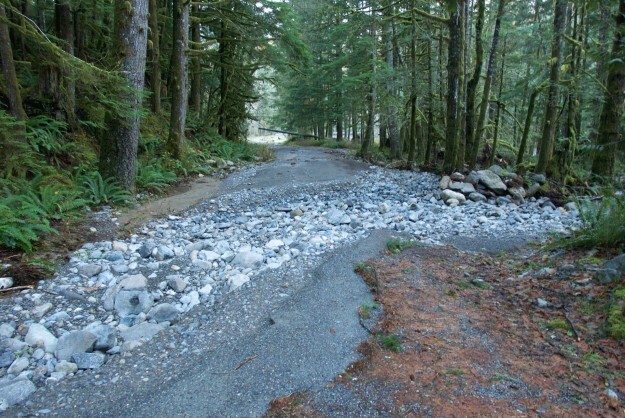 The Taylor River overflowed it’s banks and ran across the spur road to the trailhead in two places. 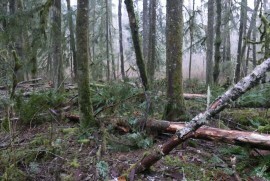 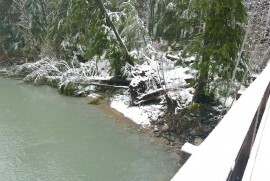 The log jam is at the left of this picture in front of the tree island. 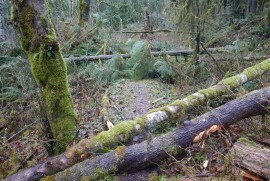 The tree with the huge root ball on the right came down the river while I was standing here. 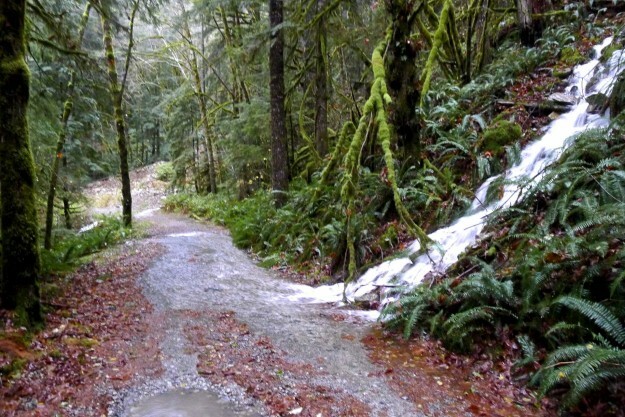 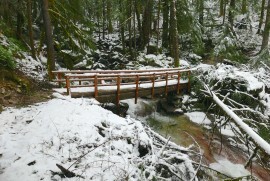 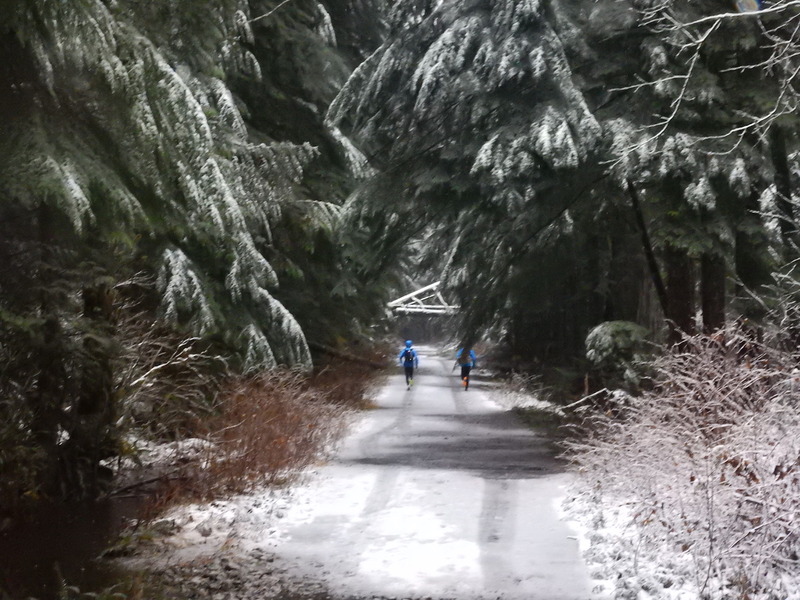 A creek flowing down an unusual spot along the road to the Dingford Creek trailhead. 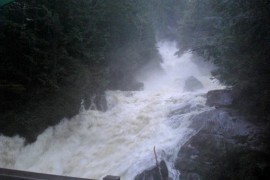 Normally this water would come down the drainage in the background. 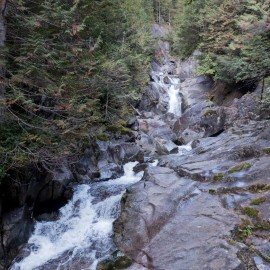 Dingford Creek falls from the bridge. 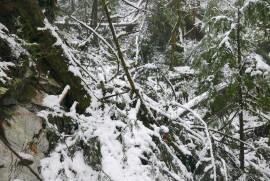 The spray was so intense it was impossible to get a clear shot. 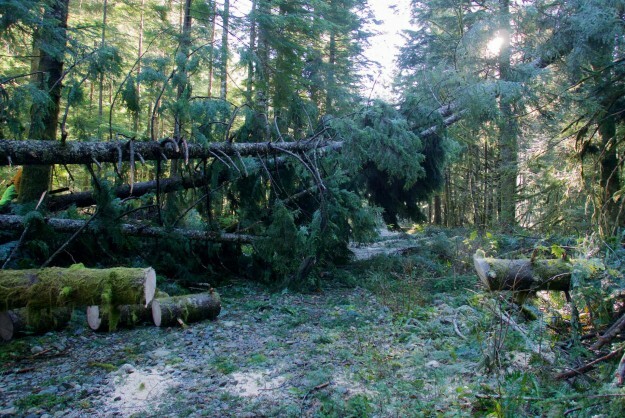 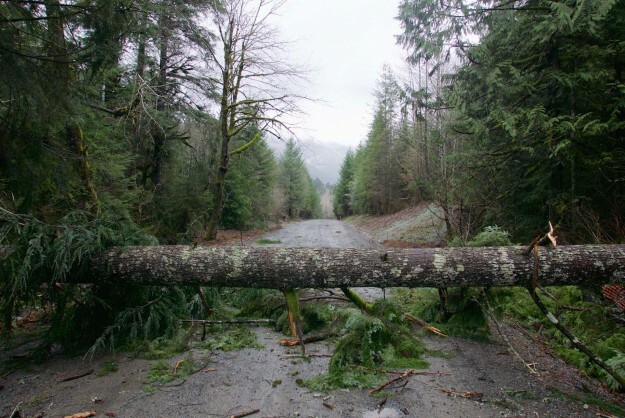 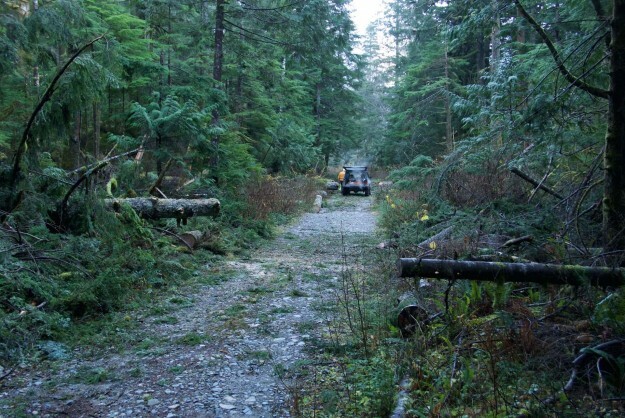 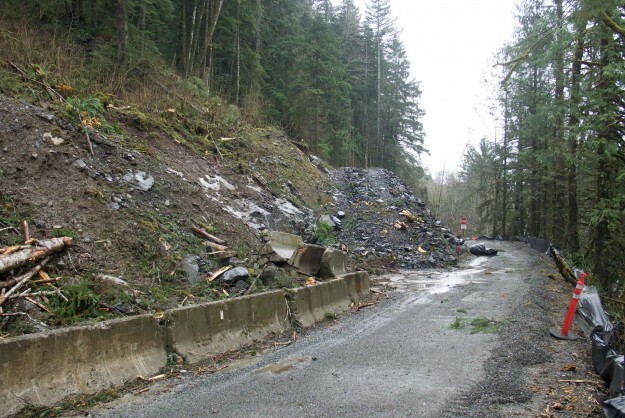 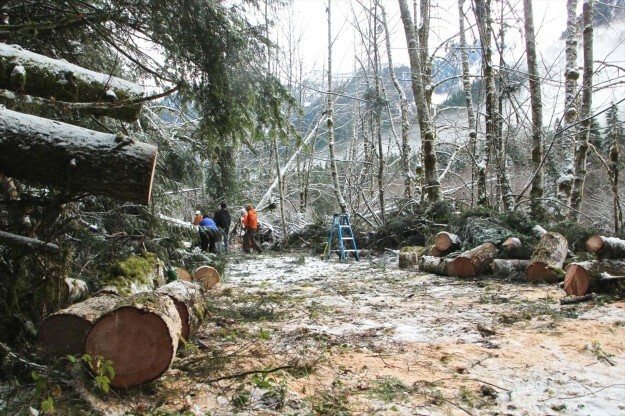 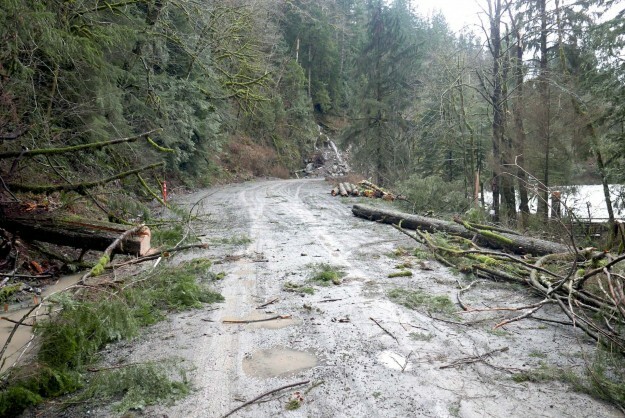 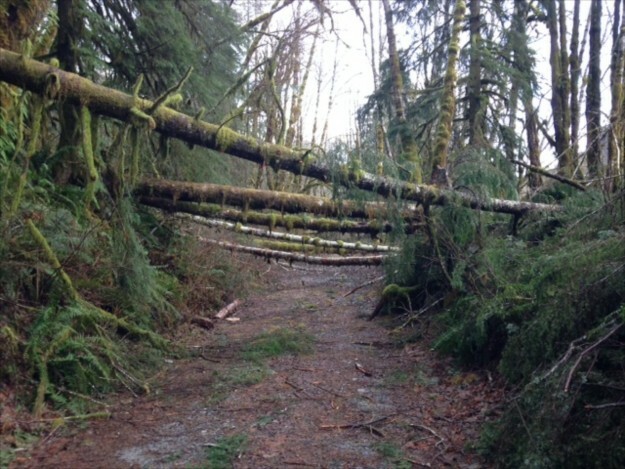 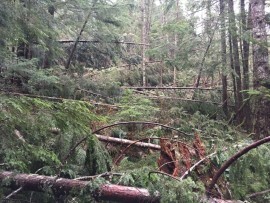 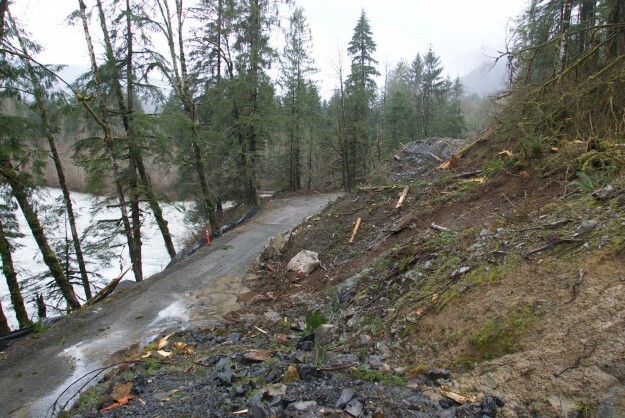 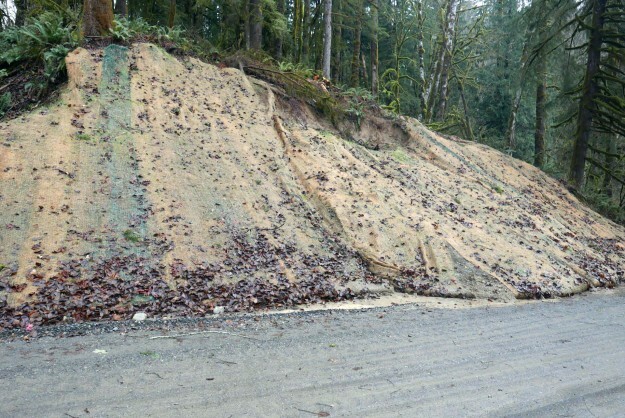 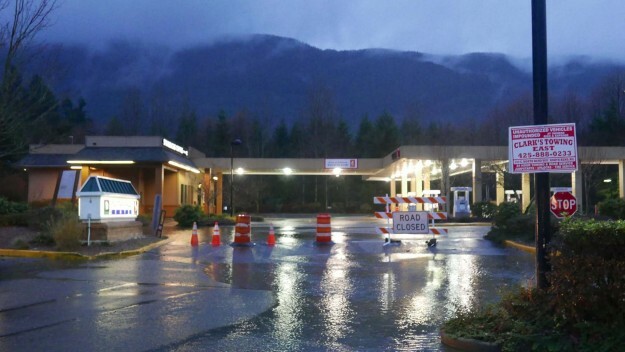 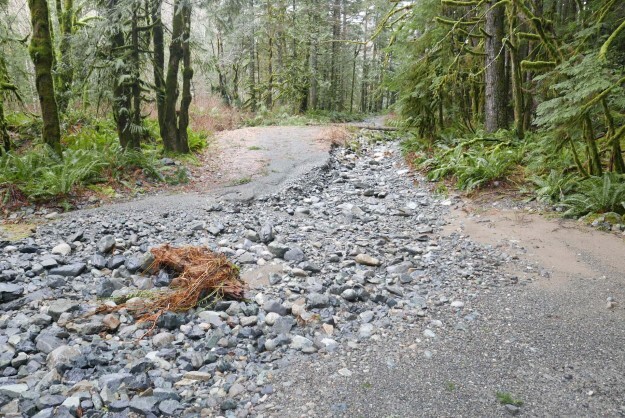 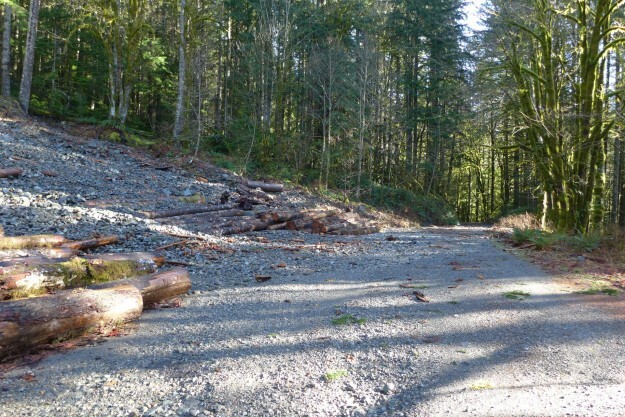 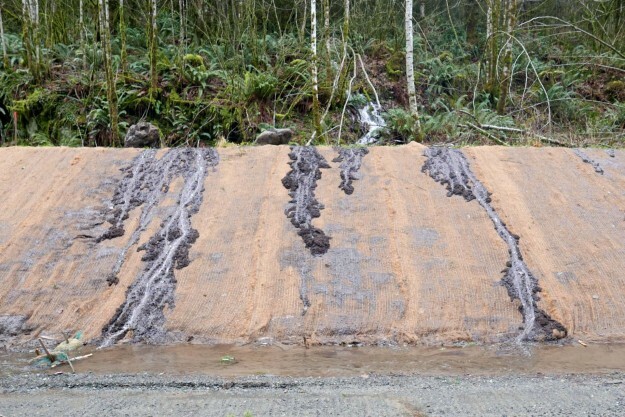 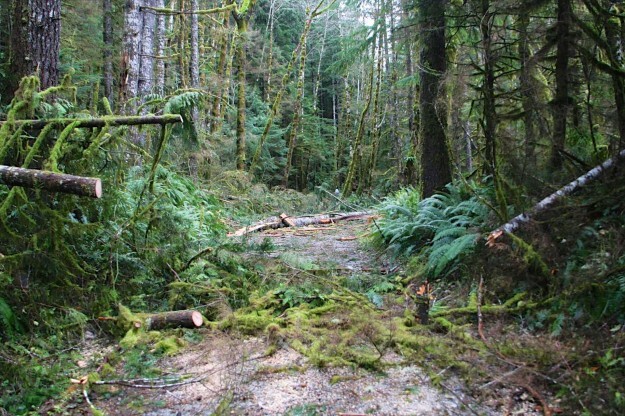 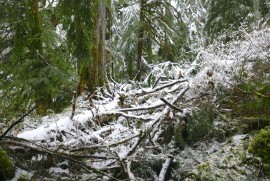 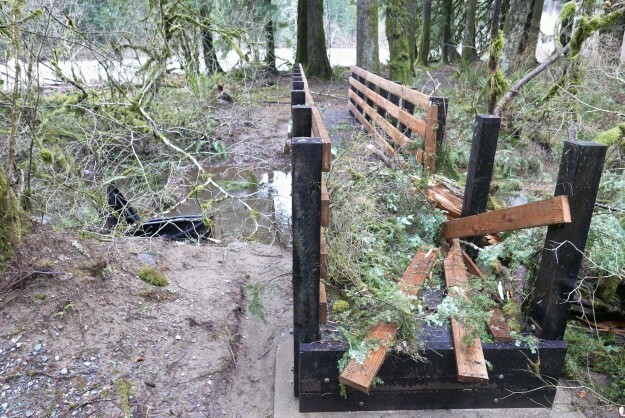 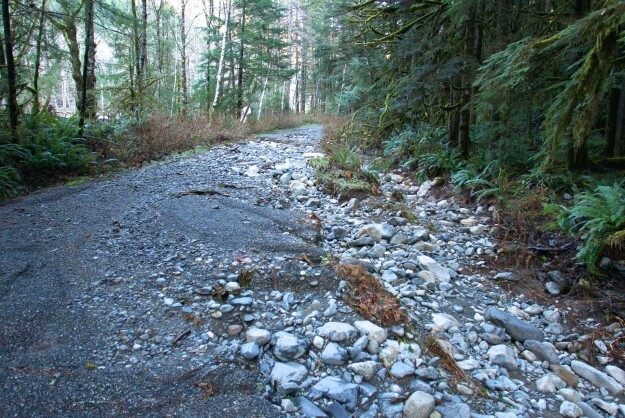 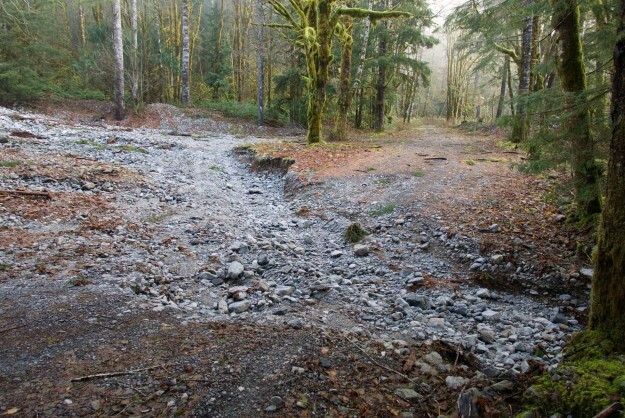 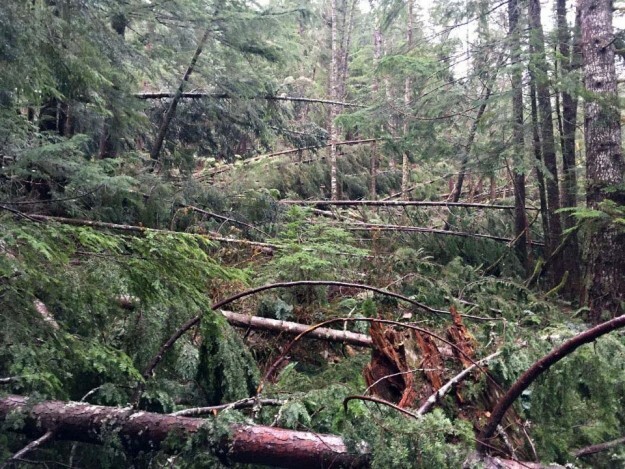 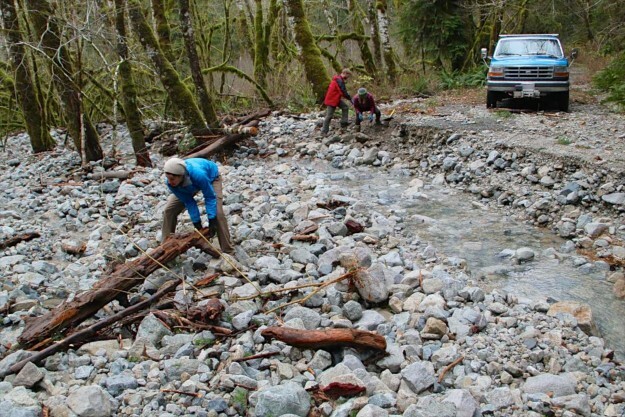 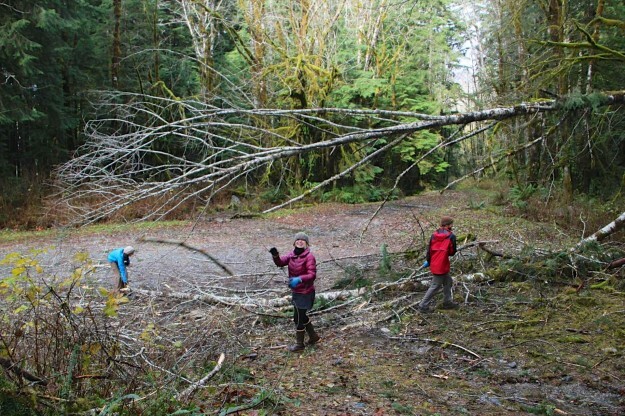 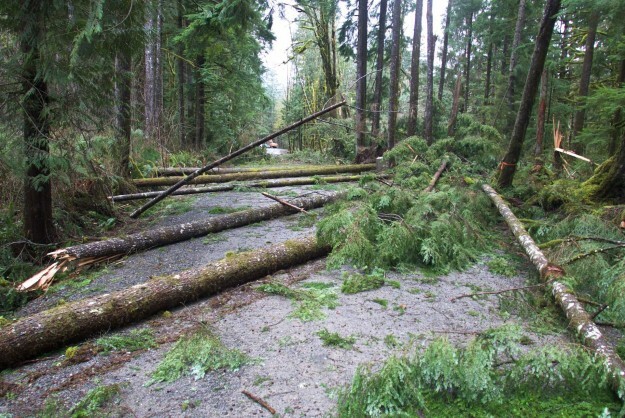 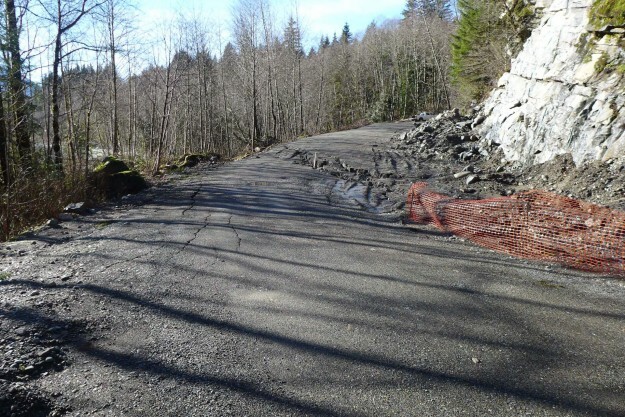 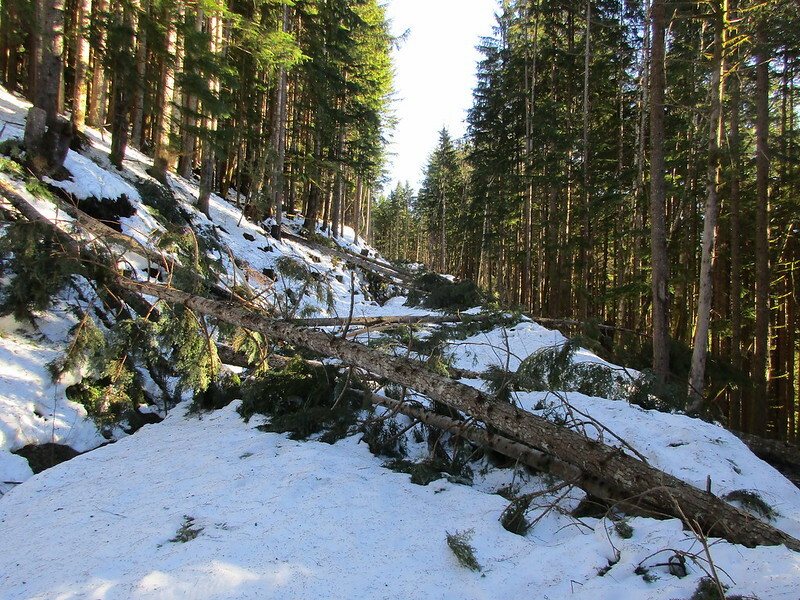 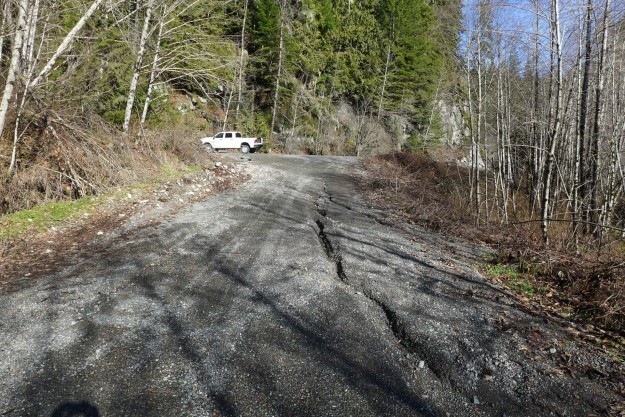 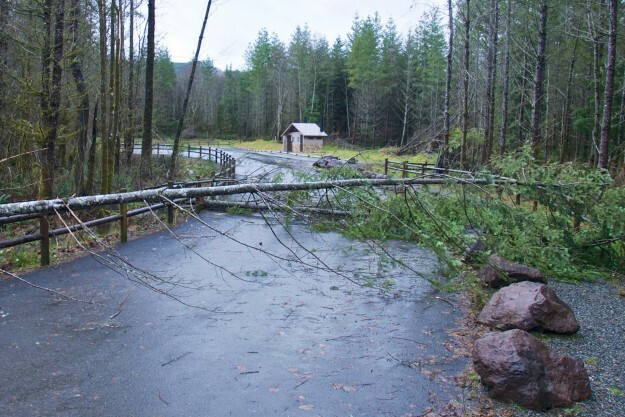 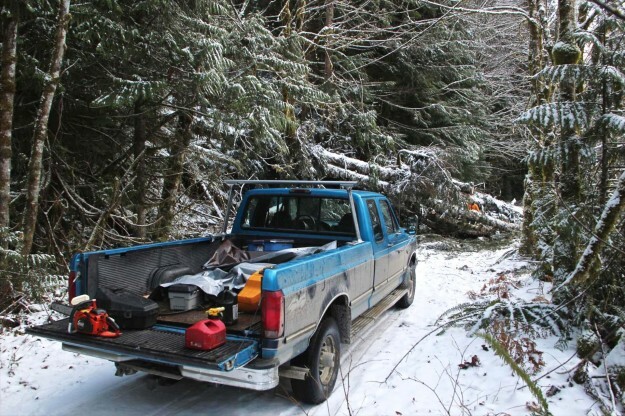 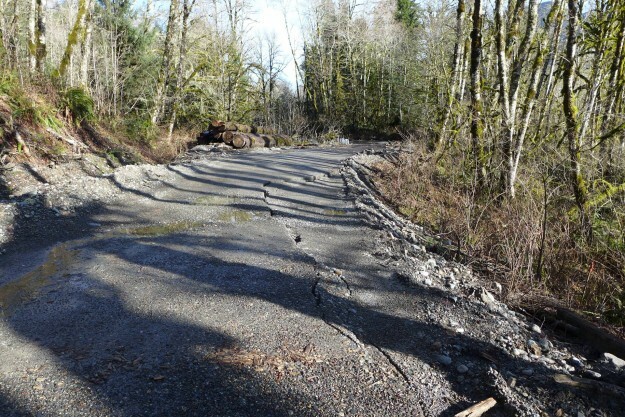 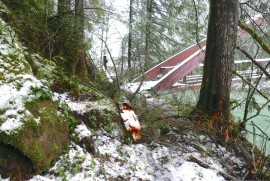 Taylor River trailhead washout on November 1 after the high water receded. 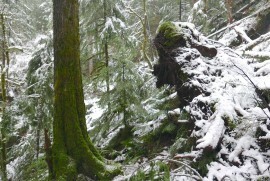 Photo by Bill Davis. 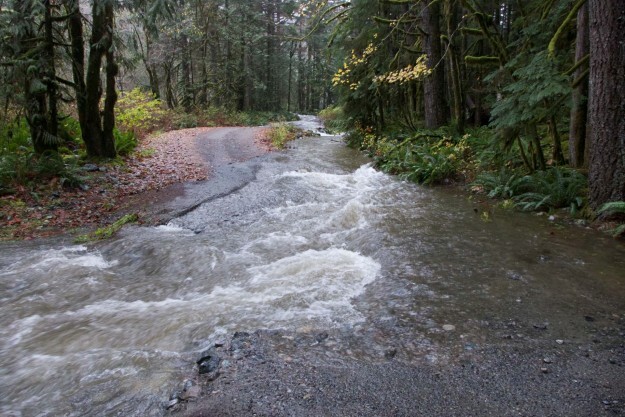 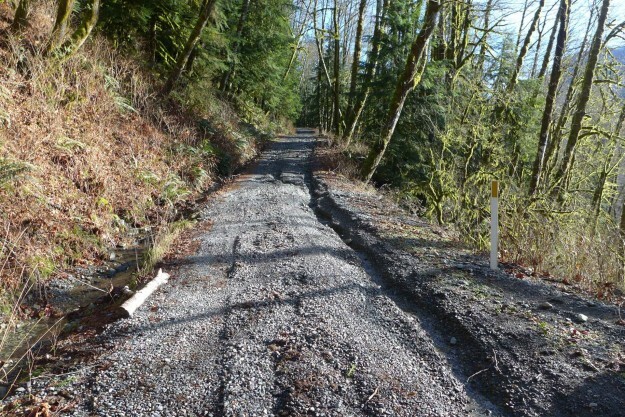 This entry was posted in Middle Fork River and tagged flood, road on 2015/10/31 by mvanderbilt. 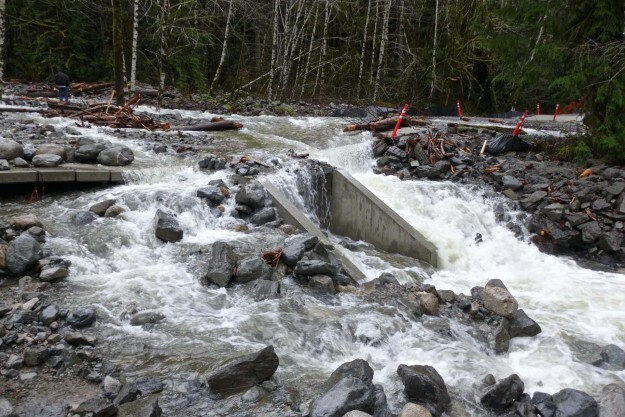 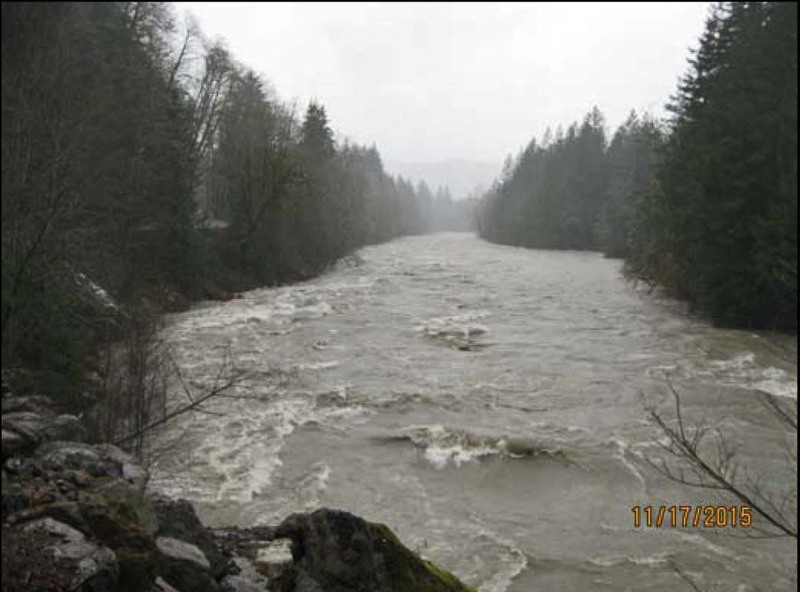 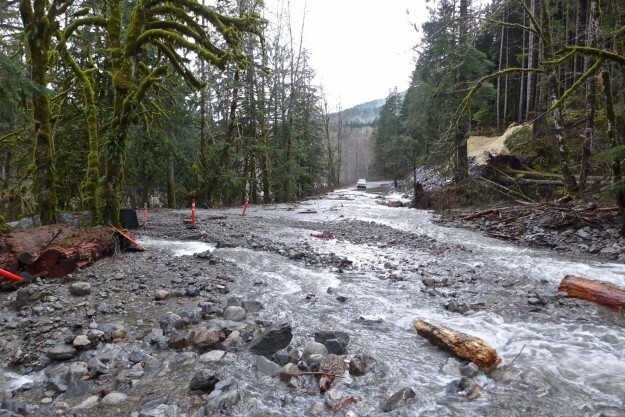 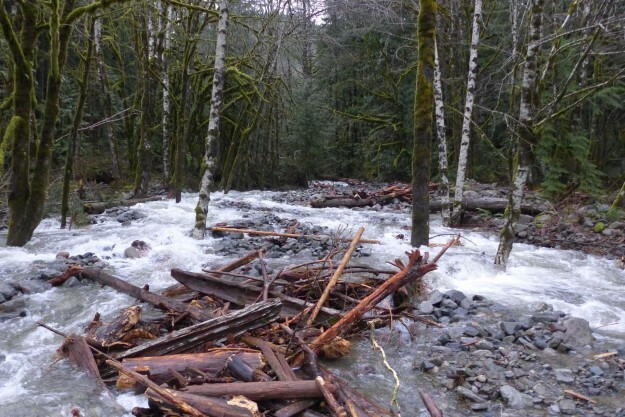 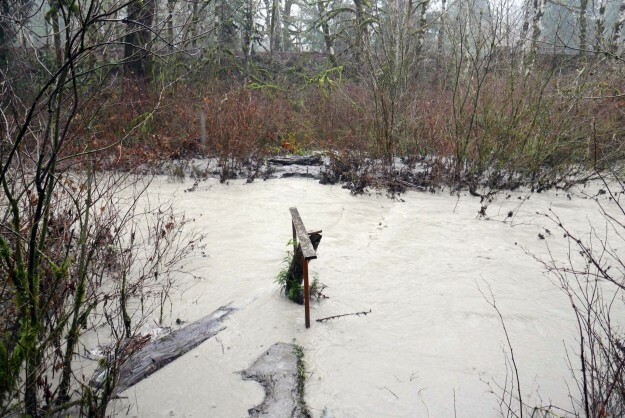 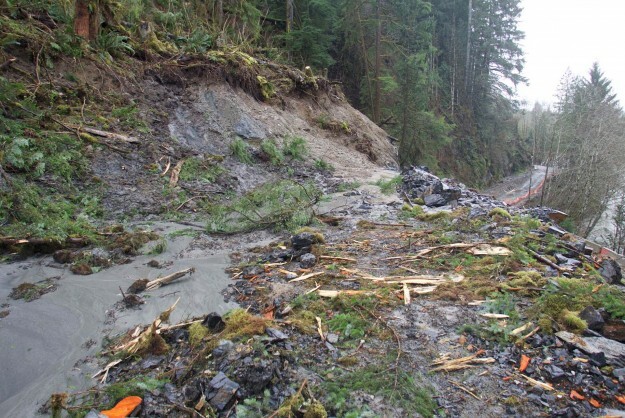 On March 13, 2013 the Middle Fork river flowed briefly at 7,000 cubic feet per second. 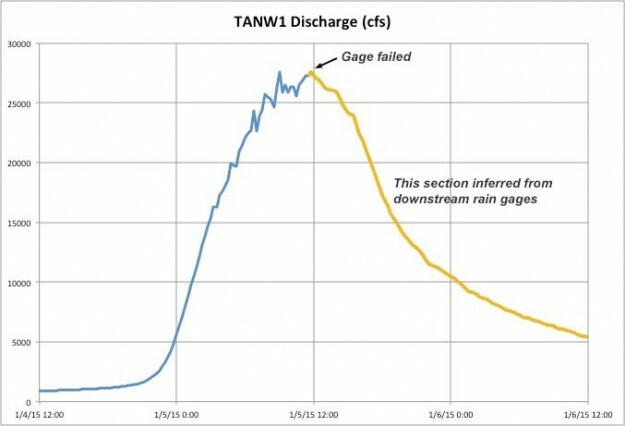 A significant amount, but well below flood stage. 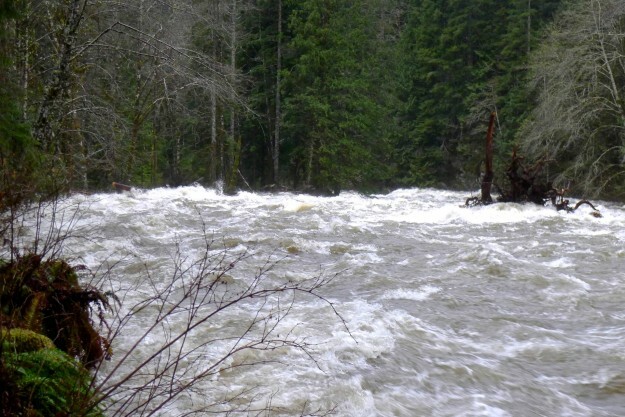 Has the Middle Fork River had it’s peak flow for the year? 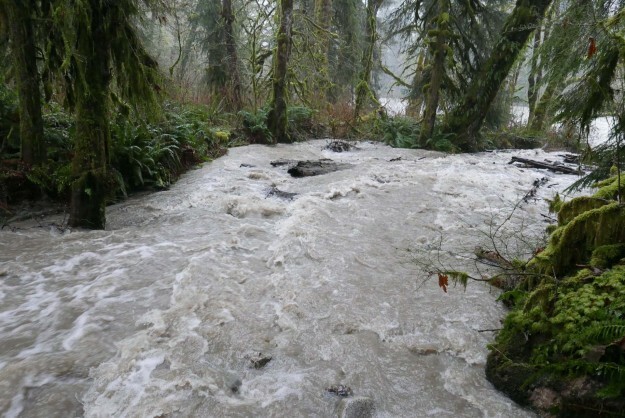 As of March 15, it’s been a mild year for river flow levels. 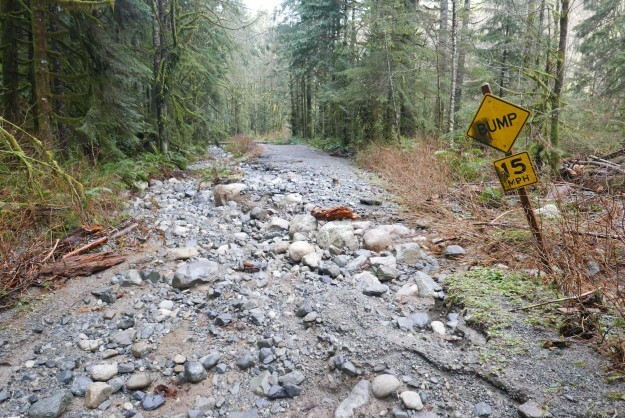 That’s a good thing because extreme levels cause wash-outs and road closures. 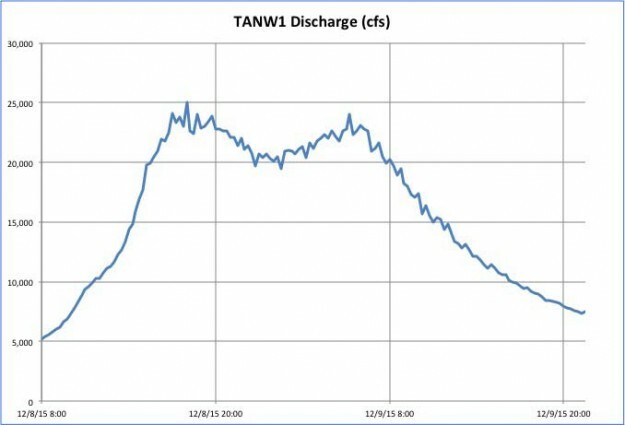 Check out the graph below and decide for yourself. 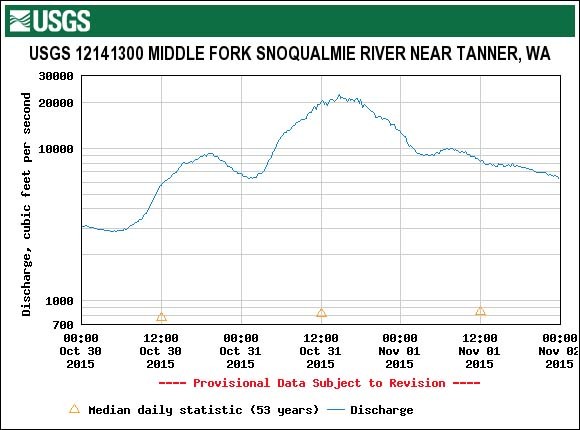 The top of the blue band is the 95th percentile river level for each day over the last 51 years. 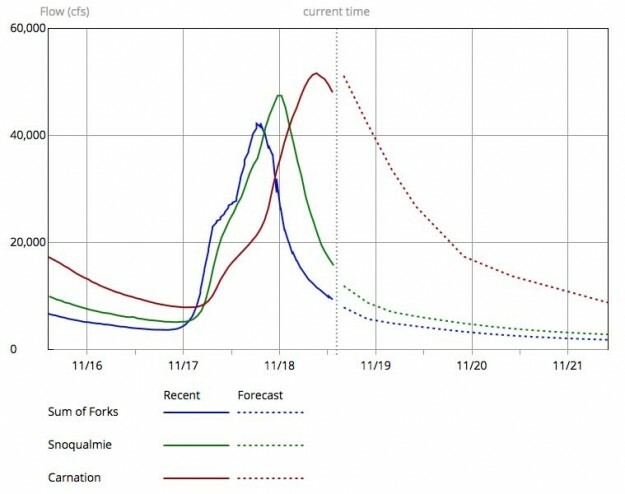 Excluding the top 5% river level readings eliminates the rare flood events and gives a more “usual” sense of when the river flow can peak. 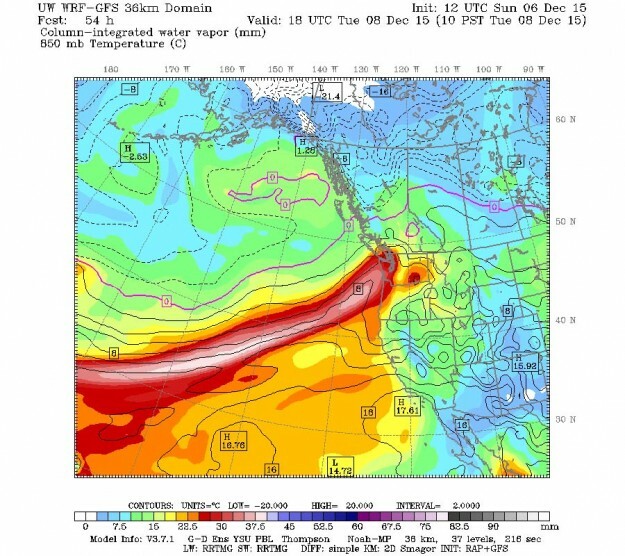 The bottom of the blue band is the absolute minimum, and since it’s not dangerous, except maybe to fish, there’s no reason to use a percentile there. 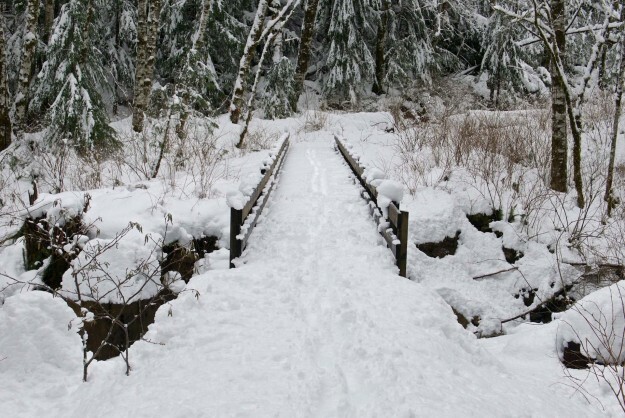 Being conservative, we’re not out of the woods yet for a major flood event this year, but given the low snow levels it’s unlikely that a damaging flood will occur now. 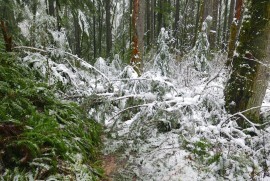 On the other hand, in 2012 a lot of the snow pack accumulated late in the year. 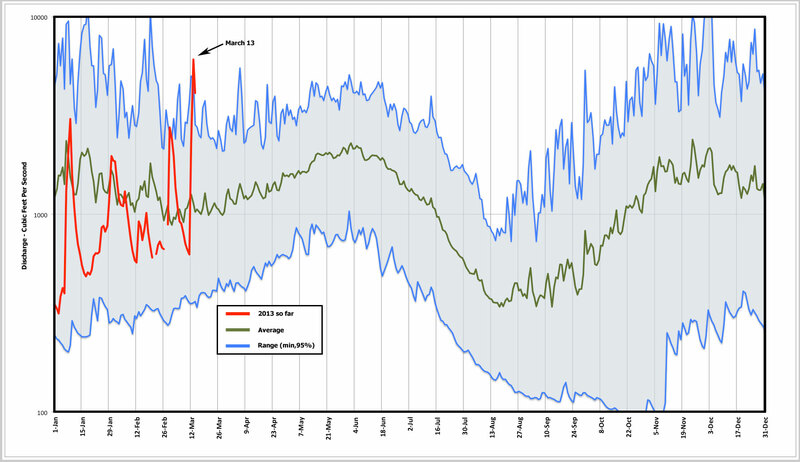 It’s too soon to tell for sure, but things are looking good for a wash-out free spring. 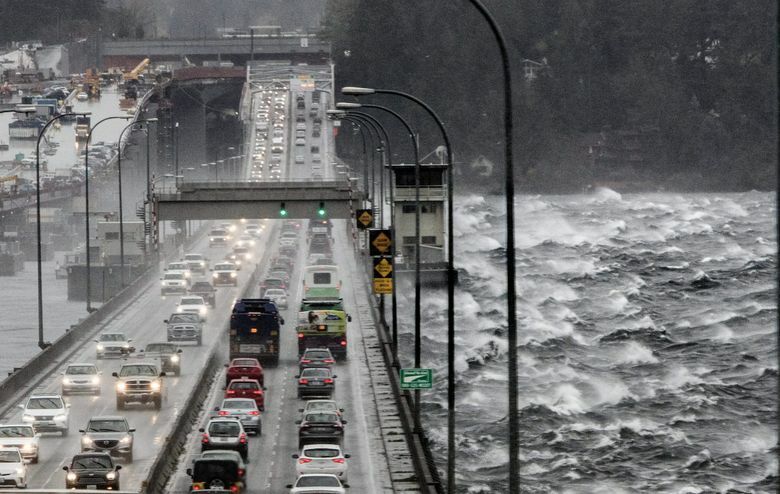 But there’s still November and December lurking, when some of the worst floods have happened. 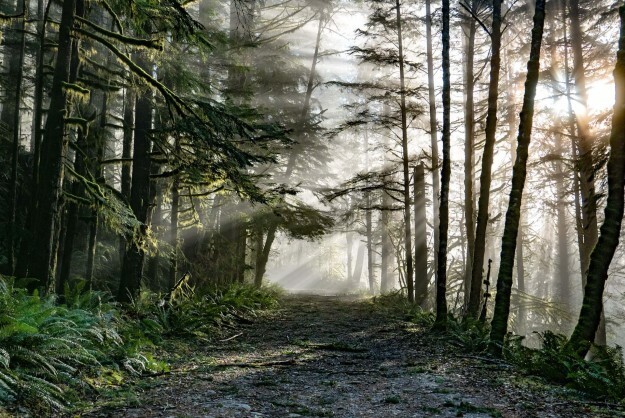 Music is Will Be Arriving by Brokeback, available from Song Of the Day, Apple and Amazon. 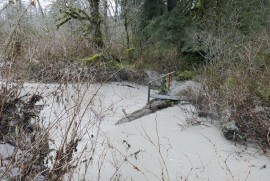 This entry was posted in Middle Fork River and tagged flood on 2013/03/15 by mvanderbilt.